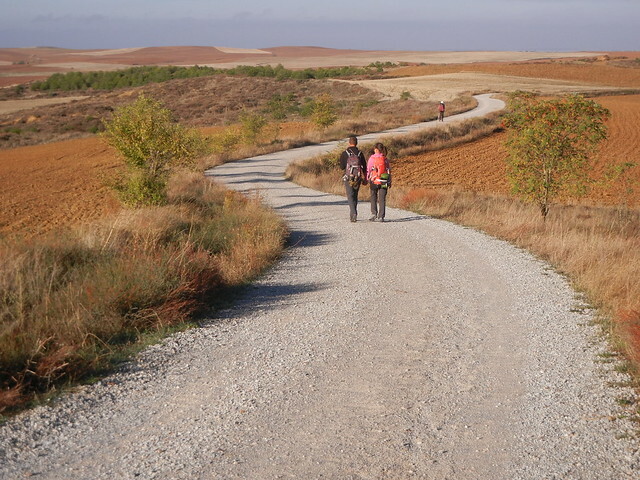 According to our calculations, Dave and I have walked four hundred and forty-four kilometers in the last four weeks. (It seems longer when you spell 444 out!) On September 10th we were back in St. Jean Pied de Port getting ready to take our first step and now we are more than half way to Santiago de Compostella. Each day has been different and memorable. We think fondly about the people we’ve met along the way and wonder how they are doing, where they are now, and whether we will catch up with them. These memories will always be treasured as well as those we have yet to create as we continue on our journey. 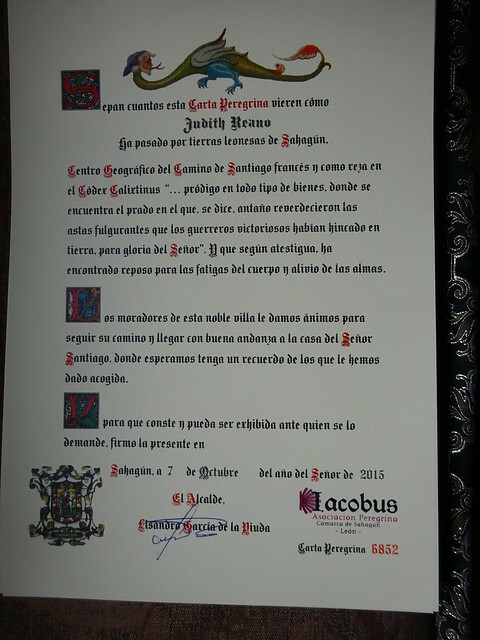 May everyone who sees this letter know that David and Judith Reano have passed through the Leon territories of Sahagun, Geograhical Centre of the French Saint James Way, as decreed by the Calixtinus Codex “bountiful in all types of goods, where the meadow lies where it is said that in the old days the victorious knights drove their shining lances (1) into the ground and they sprouted green with life to the glory of the Lord.” And, according to testimonies, you can find rest for the fatigued body and relief for the soul. The inhabitants of this noble village wish to encourage you on your journey, and may you arrive in good health to the house of Saint James, where we hope you will fondly remember those who welcomed you here. 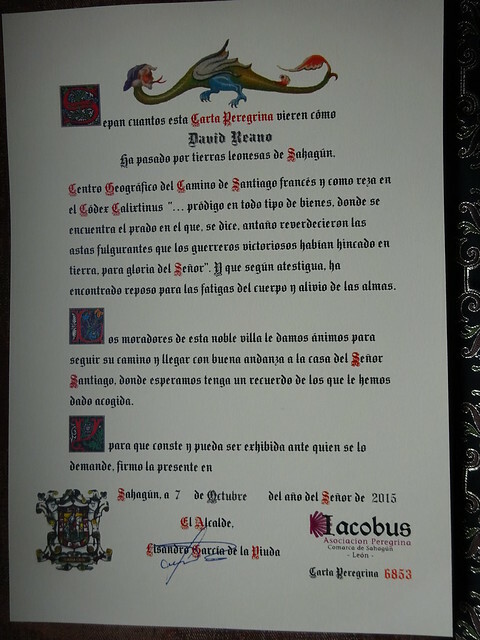 Thus it is stated and for anyone requesting verification, signed by The Mayor, Lisandro… on October 7 in the year of Lord 2015. (1) There is a legend that Charlemagne’s soldiers fixed their spears into the ground and turned into trees. Yeah! Congratulations – you’ve accomplished so much already. I think we’ll feel strange when it’s all over and we DON’T go for a walk every day! Wow! 444 km sounds impressive any way you spell it! You two are amazing! I’m still loving your blog. Many thanks! Just a little oever 300 km to go now!